Pocopson Supervisors Elaine DiMonte and Ricki Stumpo discuss the future of the Barnard House during Monday night’s Board of Supervisors meeting. POCOPSON – Discussions continued about the historic 1800’s Barnard House at the Pocopson township meeting on Monday night – as it remains a permanent agenda item. The supervisors were given periodic updates by Public Works Director Mark Knightly regarding the status of the security system over the last several months. This is the last step, according to the 2014 lease, for the Kennett Underground Railroad Center (KURC) to occupy the building. After several installation and operational delays, it was announced that the system is in good working order. After the announcement, attendees and the board gave a round of applause. Chairwoman Ricki Stumpo stated a meeting will be organized with KURC to discuss payment before handing over the keys to the building. The outstanding issue of a $30,000 payment toward the agreed upon renovation costs needs to be resolved. Supervisor Elaine DiMonte said that based on previous comments from a former member of the Barnard House Steering Committee, Lauressa McNemar, she would like to have an official and professional feasibility study done to help determine the future uses of the building, preferably with a company that doesn’t know anything about the historical site. 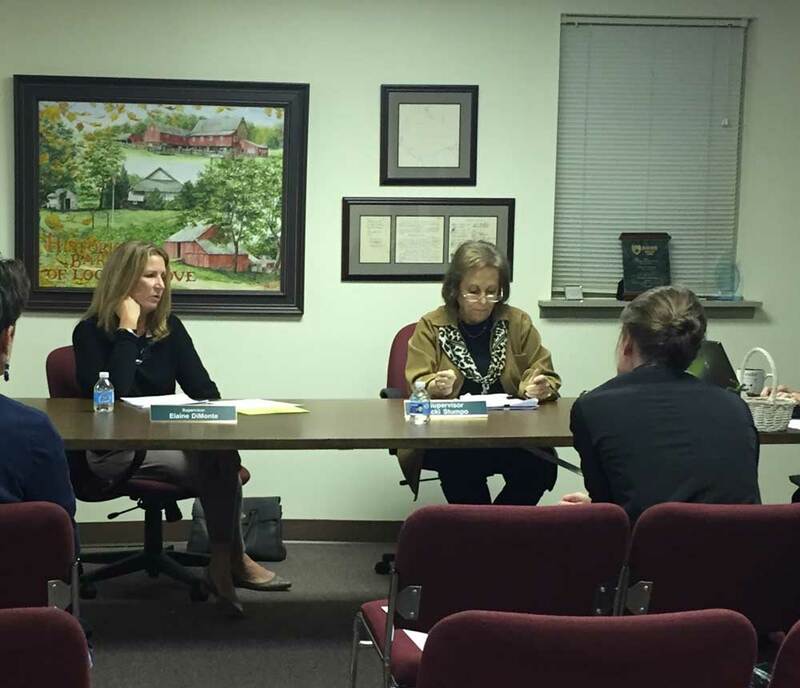 McNemar, at a township meeting in August, challenged the board of supervisors to find documentation specifically stating the building was not suitable for the municipal office. The cost of completing renovations to even occupy the building will be another concern after the feasibility study. “The amount of plaster repair needed is ridiculous. It’s possibly hundreds of thousands of dollars,” interjected Randy Mims, a member of the Historical Committee. The supervisors – Alice Balsama was not present – approved the vote to prepare a request-for-proposal (RFP) to obtain bids. After the feasibility study is complete, a meeting with the County Commissioners will be necessary to re-address limitations originally set on the building. Another historical site, the Locust Grove Schoolhouse, raised enough funds for purchase of the materials to re-do the floors later in the year, according to Mims. He also stated that all the labor will be done on a volunteer basis. The final funds of $820 were raised during the silent auction, raffle, and the sales of merchandise at the annual Pocopson Township Founders Day held on Sunday, Sept. 25. Mims said that the completion of the floors will be in April/May 2017. The goal is to have all renovations done by June in time to be included by the Chester County Town Tours and Village Walks. Mims and his wife, Sarah, invited all to the Kennett Square Applebee’s Flapjack Fundraiser Breakfast on Saturday, Oct. 1, from 8 a.m. to 10 a.m. Tickets for the all-you-can eat breakfast are available at the township office or at the door. The cost is $8 per person – $5 for kids 12 and under. Proceeds will support the continued plans for restoration of the schoolhouse. In other business, the board listened to township engineer Brittany Hackman of McCormick Taylor present a report on Aqua America’s plan to flush 30,000 gallons of water per night from a hydrant located on Nathan Hale Drive in Red Bridge. Per Hackman, the nightly flushing that could take a week or more is necessary to remove common by-products and to get water quality within the appropriate range. The water company is doing a pilot study with a new automatic device that will replace the manual work. Hackman said the state Department of Environmental Protection (DEP) approved the plan that de-chlorinates the water as it is flushed before it is released into the Pocopson Creek. “We want a condition added that it be turned off if there are any problems at all,” DiMonte said. Hackman will send a letter to the water company outlining the supervisors’ request for periodic updates in order to monitor the process closely. Stumpo added that it was also important to have them notify the township of any future flushings. DiMonte said it was a priority that homeowners be notified. The supervisors approved a letter to the homeowners’ association be sent by township secretary Susan Simone. The supervisors extended their thanks to all the volunteers and road crew, especially Chairwoman Colleen McKinney, who were responsible for organizing the tenth anniversary of Founders Day and making it a wonderful event. During the event announcements on Sunday, there was a plea for volunteers to come forward to serve on the committee to ensure the continuation of the event. Anyone interested in carrying on the annual tradition should contact the township office.